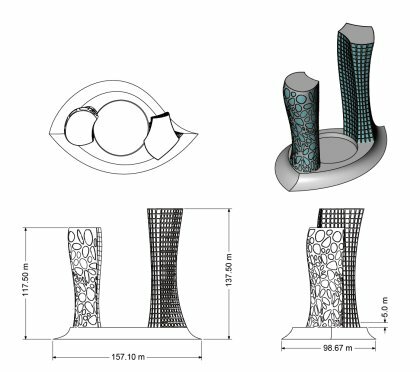 There are various 3D digital design format and 3D models generating with various 3D CAD and CG application. Once you have created, purchased, or supplied 3D model, you can rotate, scale, giving perspective angle to 3D model. You can utilize additional value of 3D models. However those using those 3D models for 2D graphica software like Adobe Illustrator, there are various limitation, for example, file format transfering and handling 3D geometry on Adobe Illustrator. If you receive general 3D data format, Rhino(.3dm), VRML(.wrml) and IGES(.iges, .igs), you can easily place those 3D geometry as Adobe Illustrator vector objects. You can view those data on Adobe Illustrator with right angle, righr perspective and right size. 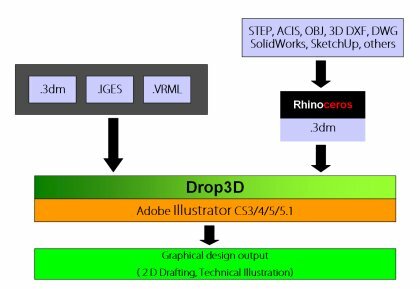 Another advantage is, if you have 3D modeler "Rhinoceros", "Rhinoceros" reads various 3D formats including major CAD and CG, you only need to save as "Rhino(.3dm)" then Drop3Dhandles all 3D date on Illustrator. Onece you view 3D data on Adobe Illustrator, you can manage 3D data with "Drop3D controller". If your 3D data has modeled with precise dimension, you can place date with correct scale. For example, if you read architectural model more than 100 meter hight, you could place data with 1/100 scale, then you can place as 2D vector objects inside of AI's artbord. If you have "CADtools for Adobe Illustratir", craeat precise dimension and create perfect drafting on Adobe Illustrator.